Earlier last week, we discussed about a fantastic online tool to generate and download unattend.xml file that we use while performing unattended or silent Windows 10/8.1/7 installation. The tool also lets you generate Config.xml file required to perform unattended Microsoft Office installation. NOTE: This guide works great on Windows 10, Windows 8.1 and Windows 7. After generating and downloading the unattend.xml file, I had to add the XML file in the bootable Windows 7 ISO file and test the same using a virtual machine before writing about the handy tool. As you likely know, editing a bootable Windows ISO isn’t a very straight-forward procedure if you don’t want to shell out a premium for paid applications. 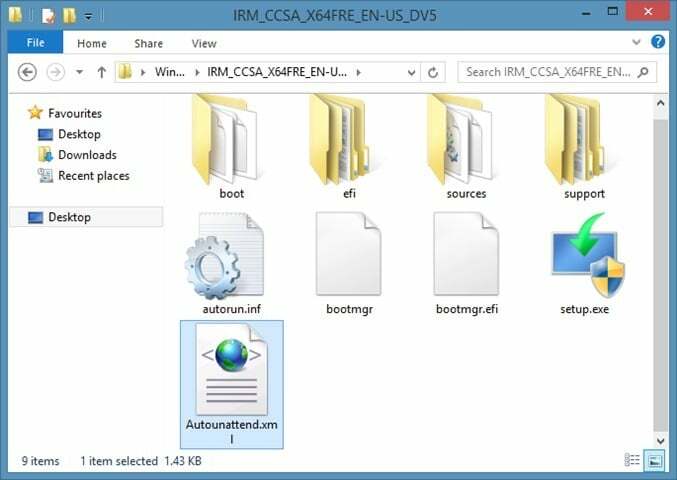 While there are dozens of free software around to create, burn and mount ISO files, a quick web search reveals that there is not even a single free program for Windows to edit bootable ISO files. Those of you who want to add files to bootable Windows ISO files without purchasing a premium software can follow the given below instructions to edit your bootable ISO file. Since we don’t have a free program to directly edit the bootable ISO image file to add files, we need to first extract the ISO file, add files and then create a bootable ISO image again using a free application called ImgBurn. Following are the steps that you need to follow in order to edit a bootable ISO to add files in Windows. Step 1: If you haven’t installed a file archiving program, please visit this page to download 7-Zip (free) and install the same. If you’re using any other file compression tool such as WinRAR or WinZip, you don’t need to install 7-Zip. 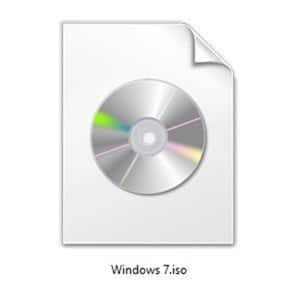 Step 2: Navigate to the location where your bootable ISO file is located, right-click on it, click 7-Zip, click Extract files and then select a new folder in your preferred location to save contents of the ISO file. If you’re using WinRAR or WinZip, simply right-click on the ISO file to see Extract option. Step 3: Once the contents of the ISO have been extracted, simply copy the file(s) that you would like to include in the ISO file. Step 4: Now, we need to create a bootable ISO file out of those extracted files. 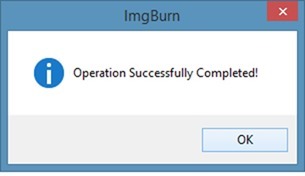 In order to do so, we need to download and install another free program called ImgBurn. 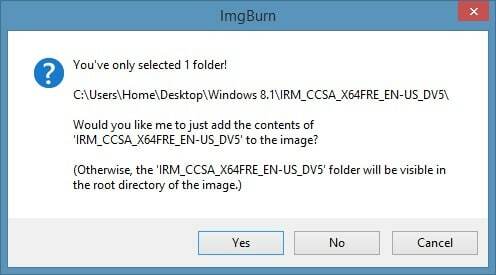 Visit this page to download ImgBurn (free) and then run the setup file to install the same. Step 5: Launch ImgBurn, click Create image file from files/folders option. Step 6: Switch to the Advanced tab (see picture). Click on the Bootable Disc tab that appears when you click on the Advanced tab. Step 7: Next, click on the small browse icon that appears next to the Source box and browse to the new folder containing the contents of your extracted ISO file plus the newly added files. Once done, select a location to save the bootable ISO file that you’re going to build in a couple of minutes. To do so, simply click the browse icon next to the Destination box and then browse to the location where you want to save the ISO and then enter a name for the new ISO file. Step 8: Under Bootable Disc tab, select the option labelled Make Image Bootable, select Emulation type as None (Custom), and then type 8 in the box next to Sectors To Load. If in case, you’re working on Vista ISO, please enter 4. 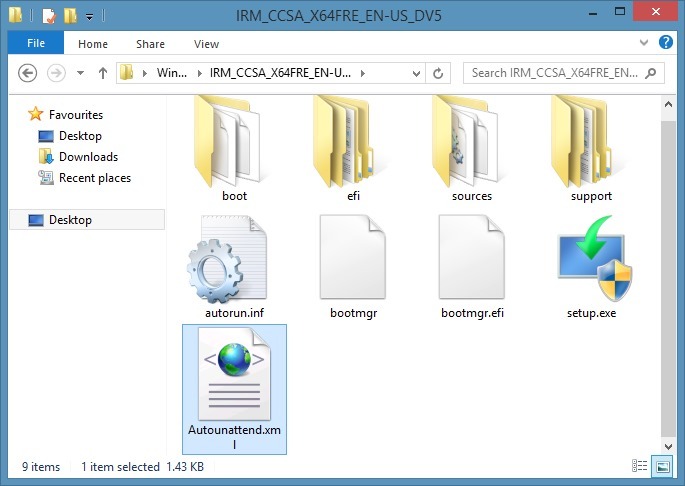 Step 9: Finally, click the small browse icon that appears next to Boot Image box and browse to the Boot folder located in the newly created folder where you have saved extracted ISO file contents. 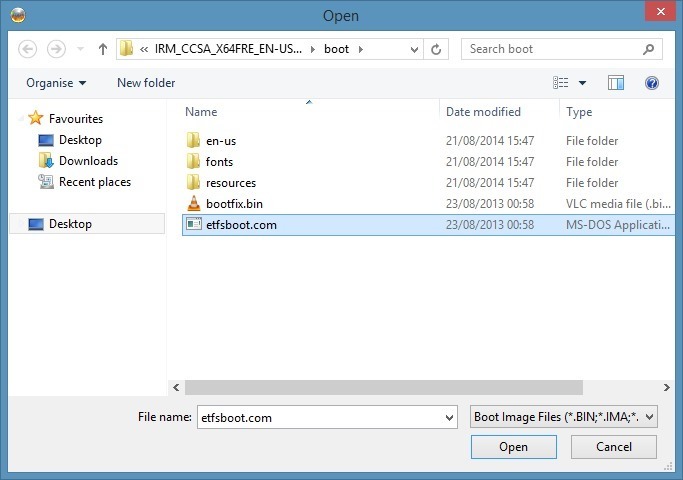 Select the file labelled etfsboot.com file and then click Open button. 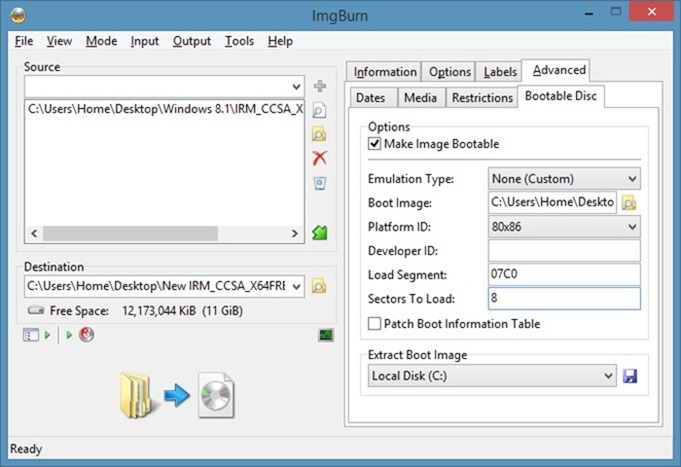 Step 10: Click Build button to start the process of building your bootable ISO image file. Click Yes or OK when you see the following three dialog boxes to continue building the ISO file. Hello Travis i have a question. How must i use the command line to make the windows 10 iso. Where to put the source folder ? Can you mail me please. @admin No thank you! This article helped out tremendously, I just took those same settings and found the command line options for each, plus a little bit of testing. ImgBurn can be run as a portable app so you can basically throw this in a folder on a thumb drive or whatever you need. No installation required. Travis, thanks for the details. Should help readers. This will load the GUI but no user interaction required. I had a need to automate the ISO burn for virtual machine testing. Hopefully this is useful for someone else out there. So quick question may sound stupid but I need help. So I put a back door into the boot folder and installed the windows to my machine shoud i except it to open every time someone start their computer? The first requisite to check is if the size of the .iso along with the new file(s) doesn’t exceed the size of your DVD. This is way to much work. Just mount the ISO you want to add a file to and you can do the rest in Image Burn. 1) First Choose “Create image file from files/folders.” 2) Second click “Advanced.” Third click “Bootable Disc” and choose “Make Image Bootable.” 3) Third choose the mounted ISO in the “Extract Boot Image” box and click the little disk next to it and then save. Choose to use the boot image file in your current project. 4) Fourth use the “Browse for folder…” and choose the Root of the mounted ISO. 5) Fifth “Browse for file…” and choose the file(s) you want to add. 6) Sixth select a destination and name for your ISO. 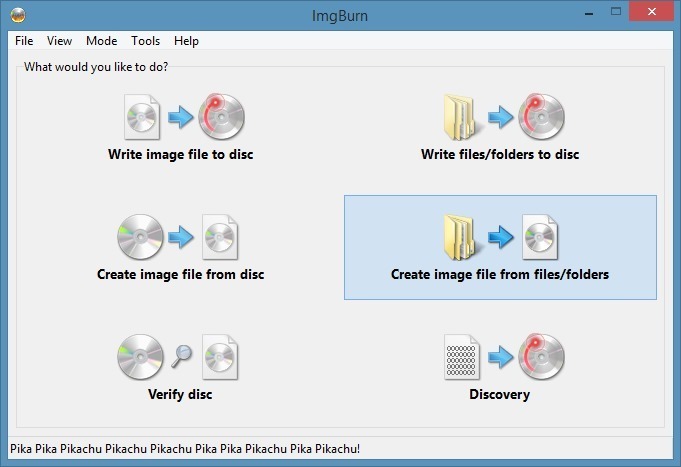 7) Seventh click “Build.” When the ISO is complete then you can write to a CD\DVD in Image Burn or use a program like RUFUS to write the ISO to USB. Thanks, very much this is working great. I wonder why there are no any open source/free iso editors though… oh well this works fine. Will above instruction work on windows 10 technical preview build 9888 iso?